Newcomer Family Obituaries - Lola M. Young 1925 - 2018 - Newcomer Cremations, Funerals & Receptions. Young, Lola M. age 93, of Cincinnati, Ohio passed away on Thursday, November 29, 2018. She was born in Spartanburg, South Carolina on April 15, 1925 to Stinson and Lola Fowler (nee Rice). She was preceded in death by her parents; daughter, Theresa Brooks; 3 brothers, 1 sister. 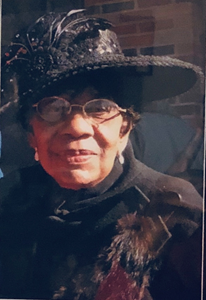 Lola is survived by her children, Rosie Isaac, Joyce (Jerry) Kyles, Joseph Young, Jonathan Young, Charlotte Nelson; 13 grandchildren; 20 great-grandchildren; and a host of other family members and friends. Funeral Ceremony will be at 11:00 am Saturday, December 8, 2018 with a visitation from 10:00 am - 11:00 am at Zion Hope Missionary Baptist Church, 3021 Mathers Street, Cincinnati, Ohio 45206. To share a memory of Lola or leave a special message for her family, please click the Share Memories button above. Add your memories to the guest book of Lola Young. MOM:: IT BEEN 4 MONTHS NOW.BUT IT STILL SEEMS LIKE YOU ARE STILL HERE WITH US.ITS HARD BUT WE ARE HANGING IN THERE TRYING TO DO THE THINGS THAT YOU WOULD WANT US TO DO.RANIESHA N LAMONT ARE DOING A LITTLE BETTER TRYING TO DEAL WITH YOU BEEN GONE.?????????? Gm grandma I miss u.Today been a whole wk since i got to say my last good bye and gave u your last hug. Hi grandma I just wanted to tell u how I miss u and love you.Yesterday was super hard for me,but I know u were proud yesterday as u had a great send off.Love your youngest granddaughter. Losing a loved one causes so much pain because life is so precious. Stay strong with God's help (Isaiah 41:10) and look forward to the resurrection (Acts 24:15). My sincere condolences to all. Grandma I miss you,already I keep looking for you to feed you,fix u something to eat of your choice,coming in from work and calling home asking what Mah mah doing.Cant wait to see u we have so many fun memories and learning lessons u taught me. Her battle is finally over and she has gone to a better place. You have been a dedicated daughter and friend. Now take some time for yourself, knowing you did the best you could always. I am honored and blessed to have met Lola. It was truly a blessing to have her and J.T. (James Rice) meet again in Pigeon Forge, Tennessee after so many years had passed. May the love and peace of God carry the family through the days ahead. No matter how old we are as children, our mother hold a special place in our heart that can never be replaced! I am sorry for your loss. I hope as a family you can find comfort in each other and in God's promise now and in future at Isaiah 66:12, 13. You all are in my prayers. Praying for this family. I remember Mrs.lola Mae when she and her family would visit Spartanburg, South Carolina. She was always warm and inviting when my parents would visit Cincinnati. Mom, you had a profound impact on the woman I have become later in life. Not only were you my mother in law, you stood in the place of my mother during her illness and after her passing. Your love and concern for the girls and me never deminished. Your words of encouragement and support will always be with me, and you will always have a special place in my heart. I will miss you deeply Mom. Not only were you my mother in law, you stood in the place of my mother after her passing. Your love and concern for the girls and me never deminished. You will always have a special place in my heart. Everybody probably know but I’m Raniesha the youngest grandchild of my grandma.Basically everywhere my grandma was I was somewhere near.I just want to say from here on out my days & nights will be long without you. I always enjoyed every single moment we had together no matter if it was sitting at our favorite the kitchen table talking w\ no tv on,eating,& us up late,me sneaking you food here when your health started failing.I just want to sayI love u grandma like I always told u.You taught me a lot & still was teaching me up until the day you were entered into heaven.